Built up letters are usually used as a way of displaying your business name on external walls, shop frontage or above reception areas. The letters of your business name are cut out individually to create a sleek 3D effect. Why Should You Choose Built-Up Letters? 3D, built-up lettering that spells out your business name looks stylish and professional, creating a great first impression to your potential customers. Adding lighting behind the lettering highlights your business name so it’s easy to read, and can be viewed both day and night. We can also print your logo too, letting it stand proudly next to your business name. 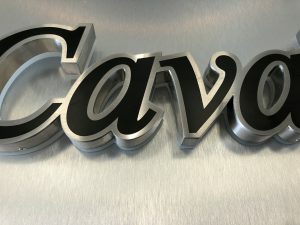 We can create both illuminated and non-illuminated 3D lettering on a variety of materials such as metal, stainless steel and Perspex. These can be polished or completed with a matt finish. We can cut lettering and logos of any size and these can be fixed or hanging. 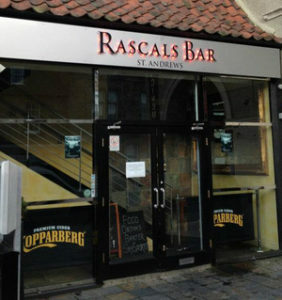 This is our most popular option as LED lighting will make your sign really stand out. 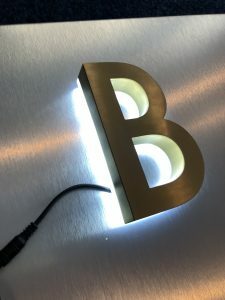 You can choose from a variety of LED colour lights that will create a soft glow around your letters, so you can be advertising your business even when you’re closed. 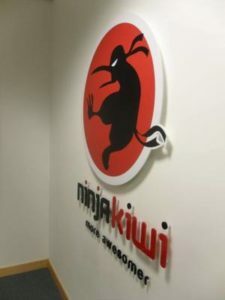 This is an option where planning or logistical restrictions prevent illuminated signage, however, they are still an effective and affordable way of branding your business. Why Are the Benefits of Signature Signs Built-Up Letters? Aluminium and stainless steel are hard-wearing and durable materials – made for British weather! 3D letters aren’t just for outdoor signage. It also works well indoors too! If you’re interested in 3d lettering for your business signage, or would simply like some advice, then don’t hesitate to contact us or call us on 01382 610016. We have over twenty years combined in the signage industry.